The direct translation of æbleskiver is ‘apple slices’. My personal translation of æbleskiver is delicious Danish Christmas perfection. It’s a special Danish Christmas food. A cross between a doughnut and a pancake, served with raspberry jam (to dunk in) and icing sugar. Quite simply, delicious with a capital D and something you need to try if you haven’t already. Perfectly round little fried doughy balls, served warm and typically in the socially acceptable quantity of 3 per serving. You can find them at many of the Christmas markets throughout the country as well as bags of frozen versions at the supermarket. But to really live like a Dane – you need to try and make these yourself. At least once. Or do what I have, and find a Dane to make them for you. The recipe is super simple, but it’s the technique and special æbleskiver frypan that will cause you most difficulty, especially if you live outside of Denmark. So if you’re not in Denmark, then do your best with google, or hunt out a Dane living in your country. They might just have an old pan stored away somewhere collecting dust. Baking margarine (if you’re in Denmark, otherwise just ordinary butter/magarine is fine for greasing the frypan as you bake them. Add the flour, salt, sugar, baking soda. Mix together and then add the eggs and milk. Mix until smooth and feeling a bit thick. 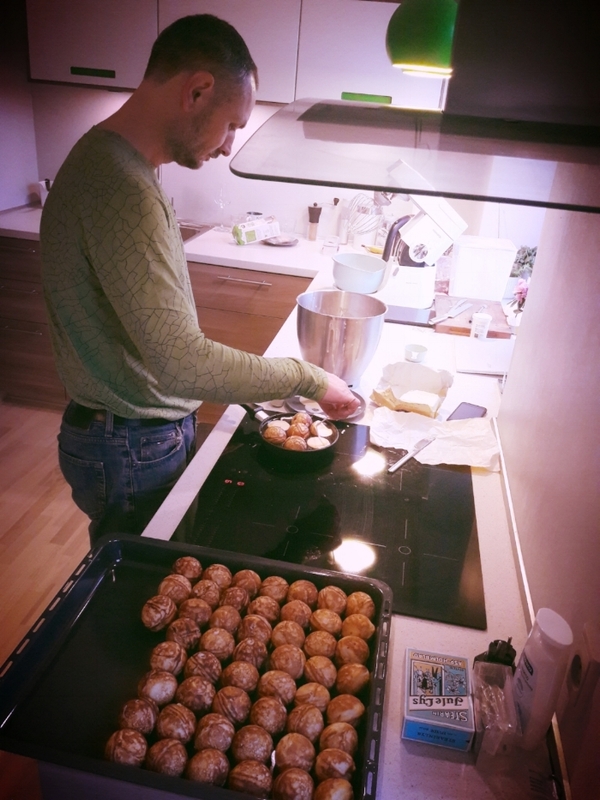 Then grab your æbleskiver frypan – and get baking like a Dane! The trick here being that after pouring in batter, you need to keep turning the dough so it forms a round ball. A bamboo skewer is perfect for this job. Check our our video for a first hand demonstsration by an authentic Dane. Serve in three’s (of course) with a dollop of raspberry jam and icing sugar on the side. For more food highlights of the Danish Christmas season, check out this nice little article from a fellow Copenhagen friend, Gina. And if you haven’t heard about the Danish Nisse yet (a mischievous Christmas Elf that visits in the middle of the night) – then have a read of my article in this month’s The International. All about how to make your own Nisse house another Danish tradition worth knowing about especially if you have little people in your house.